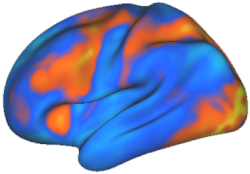 Patient H.M. had terrible epilepsy originating in the medial temporal lobes. His neurosurgeon decided to take out the source of the epilepsy: the hippocampus. Surprisingly, after the operation H.M. could no longer form new long-term memories. He could remember things for short time periods if he wasn't distracted (i.e., he had near normal working memory). Also, he could learn new sensory-motor skills, though he could not recall how he learned them. Patient H.M. is still alive today, and has no new episodic memories since the early 1950s. He still thinks he's in his twenties, and meets his doctors anew each day. Some have compared his experience with those dramatized in the movie Memento. Implication: The mind, largely governed by reward-seeking behavior, is implemented in an electro-chemical organ with distributed and modular function consisting of excitatory and inhibitory neurons communicating via ion-induced action potentials over convergent and divergent synaptic connections strengthened by correlated activity. A part of that organ, the medial temporal lobe, is essential for memory formation.